It’s coming….It’s almost here! The time of year we have all been waiting on. The time when things get exciting and when there is good cheer in the air. When people are buzzing around, shopping and feeling like spending their money. No it is not Christmas, it’s even better, BACK TO SCHOOL! Parents can’t wait till their little darlings are back where they belong, in the care of someone else. They are so happy and excited they want to find actives for the kids to keep them busy from morning till night. 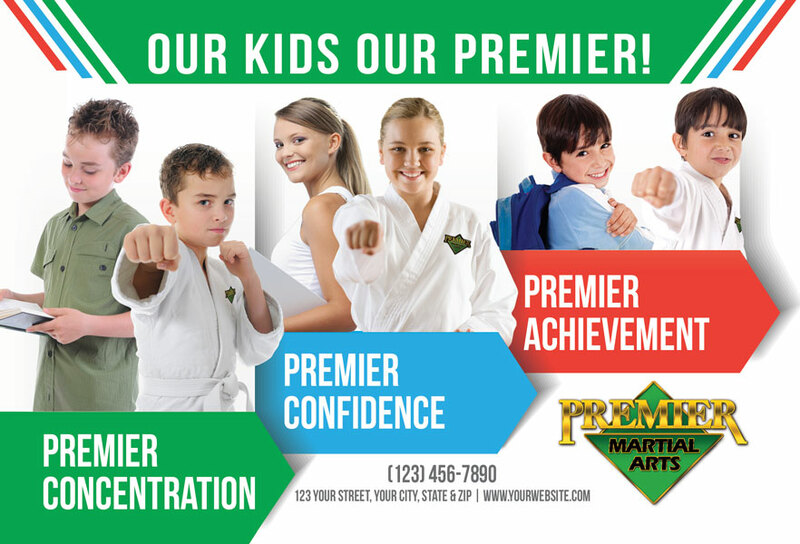 So now is our chance to share with them the benefits of the martial arts and give them a positive place, with positive people, that teaches personal protection, personal development, and will give parents peace of mind. People will be settling in from their vacations, summer activities, and will be getting prepared for another school year. Whether it is children or adults, this time of year people are more willing to begin a new activity. Back to School time should be one of our busiest times of the year. With proper planning this time of year, we can easily take our schools to the next level. This is ONLY for struggling schools that need to sign up some students fast – THIS IS NOT OUR NORMAL SYSTEMS OR RECOMMENDED FOR SUCCESSFUL STUDIOS. Email this to your prospect list and run this as an Facebook ad for a very short period of time. This is a Special Offer – Not a Gimick! Only Select Families will Receive this Offer. 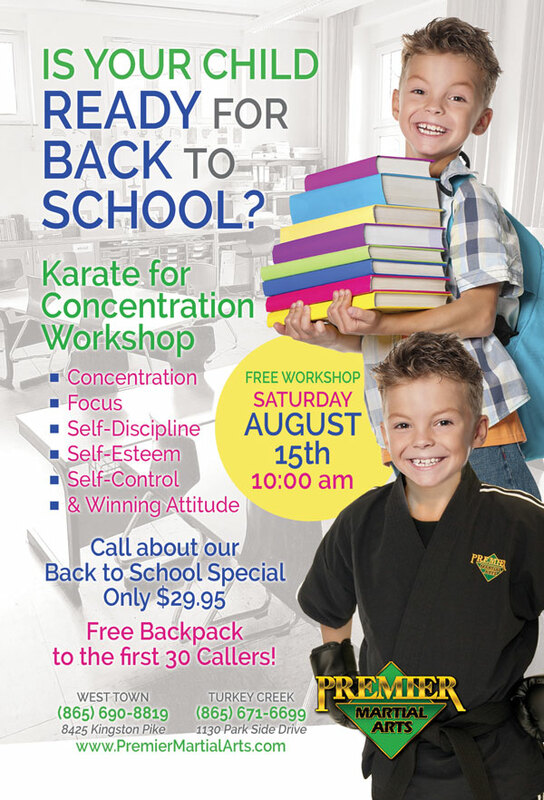 BACK TO SCHOOL KARATE – SCHOOL YEAR SPECIAL! ONLY $99 PER MONTH! INCLUDES A FREE UNIFORM! Normally $125/mo. with Initial $195 Fee Waived! YOU SAVE $500.00! No One Sits on the Bench at Premier Martial Arts! Below are important marketing strategies and preparations to make sure your Back to School promotion is successful. 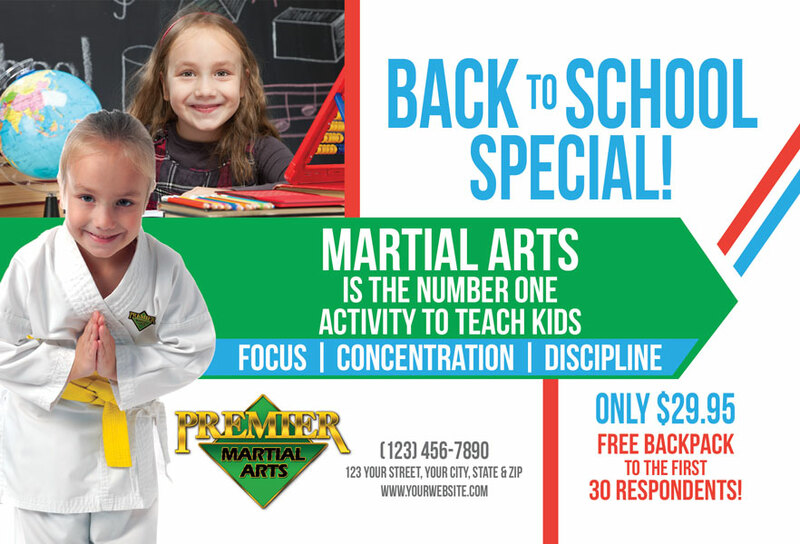 Our Back to School Promotions will run from 3 weeks before schools starts to 3 weeks after school has begun. Basically, when you start seeing national companies like Wal-Mart, Target, or Office Supply Store, you know back to school promotion should start. And Remember, parents and kids settle into this time of year quickly, don’t linger into back to school promotion too long after school has started! Timing, preparation and follow though are crucial for any marketing campaign. You must order all marketing products for your campaign tasks and for this busy time of year six weeks before school starts! Order all of your items that you will need to promote your school..NOW! 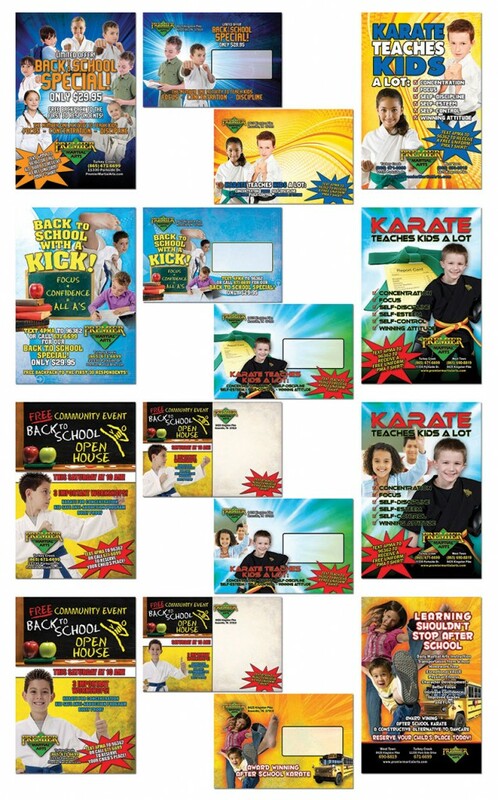 Brochures, tent cards and book markers are available at www.martialartsmarketing.com. Other great promo items are tattoos, logo stickers, book covers, coffee cups, giveaway free pencils, and magnetic school event calendars to all schools in your area. Call at Century at 866 339 8800 to check there custom pricing on these items. Develop a back to school offer for your marketing campaign. Use this offer in ALL of your marketing to be consistent. This year your offer could be “Four Week FREE trail program, with a FREE uniform for the first 30 callers, No commitment to continue! Or, I am recommending. 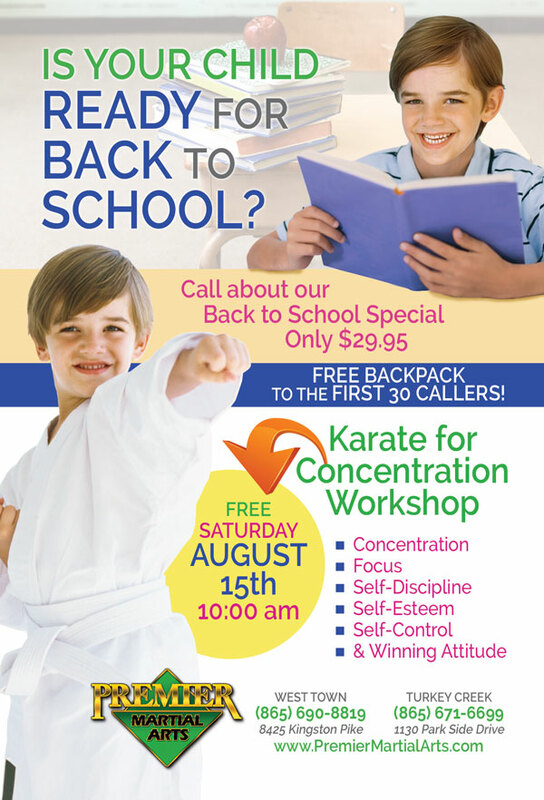 “An Martial Arts Quick Start Course for Only $29.99 with FREE Back Pack for the First 30 Callers! This is the time of year that people are the most willing to sign up, so we do not need to give away a free month to entice them. This offer will allow you to make money on the introductory course, pre-qualify more interested people, and we do not have to waive the down payment like we do when we offer a free month. 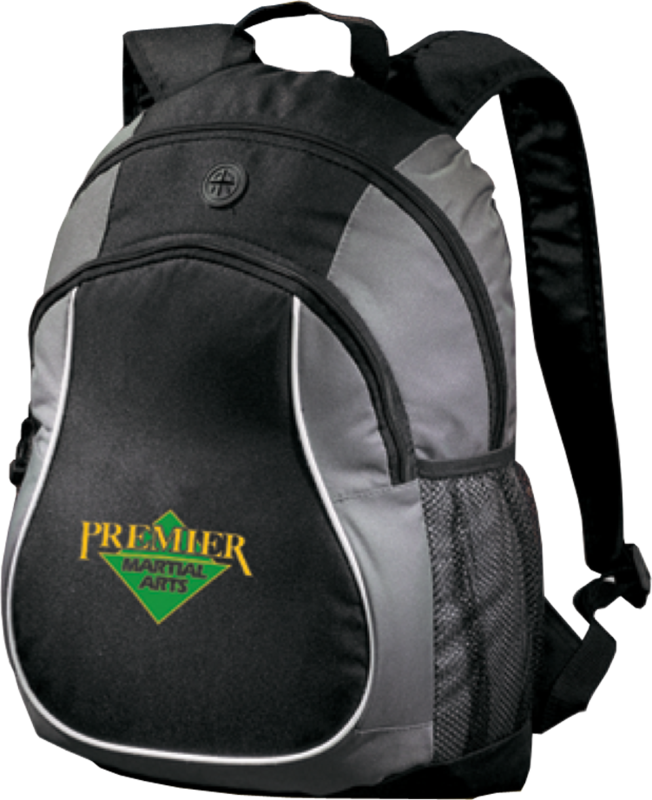 We have tons of Back to School Promo ads and materials for you to choose from…. 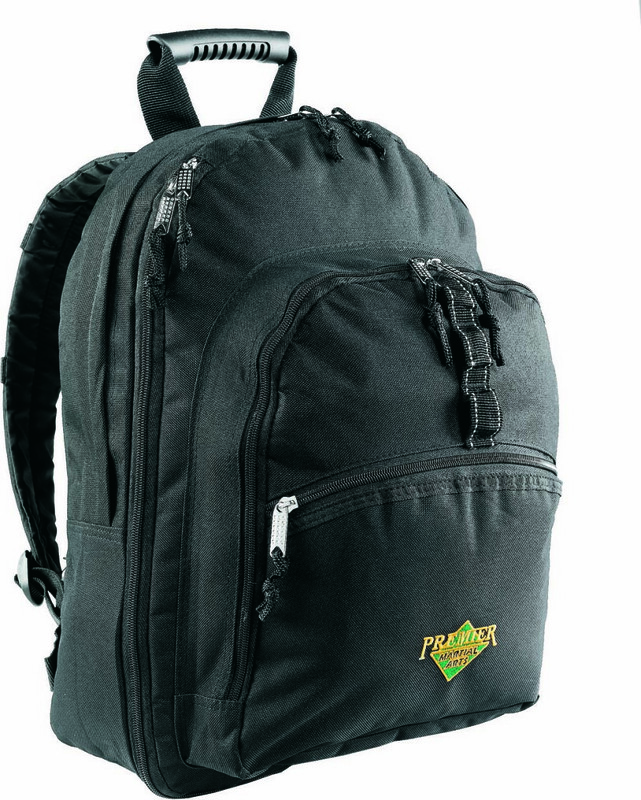 You can order the different back packs or sling packs from at Century at 866 336 8800. Now is the time if you are going to dip into your advertising funds and go all out. It is very important to, Plan your Work, and Work your Plan! Create relationships with at least 6 retail businesses that will become Promotional Partners. We will have a goal to conduct promotional booths with at least 6 retail businesses over this campaign. The following is a list of ideas for partners! – Introduce yourself and begin a networking relationship by gathering information on how you can become a part of Partners in Education. I suggest you adopt one or two elementary schools in your immediate market. – Explain PMA’s commitment to community service and explain your fund raising ideas for the school board. – Ask for flyer approval to promote your community service events. 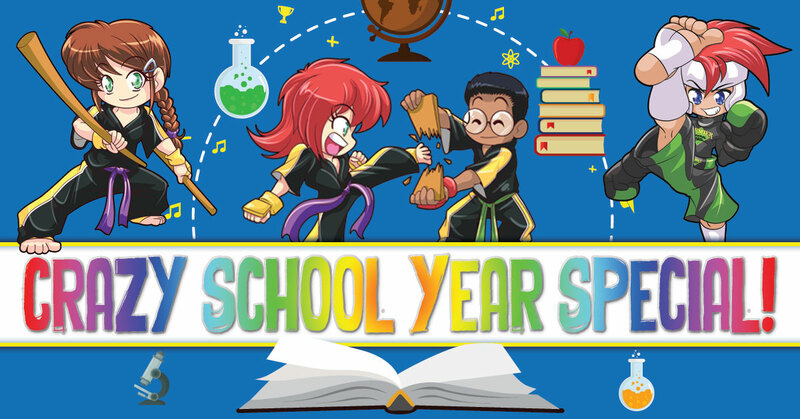 – Explain our teacher appreciation month promo and offer the services of free self defense seminars for all teachers, free month of classes, and a free school talk for their classes. – After this meeting you will know what your other objectives are to be. If you did not get permission for school presentations or flyer approval, then you now know that you are to proceed with meeting with the gym teachers, PTA and the local schools principles, in that order, until you are successful in getting presentation approval. In a meeting with any principles, conduct the meeting with the same objectives as you had with the school board meeting. – Who conducts these Meetings? – How much does alternative media source cost in your market, newspapers for Schools, Colleges, and Universities. Get out Rack cards in local businesses! Order marketing materials – rack cards, marketing cards, door hangers, direct mail letters, direct mail post cards, and flyers. Be Prepared!